Salespeople worldwide are struggling to connect with buyers and engage in meaningful conversations that create value for the buyer. Buyers are making much of the buyer’s journey without salespeople. CEB suggests on average, that buyers are 57% of the way through a buying process before they contact a vendor. 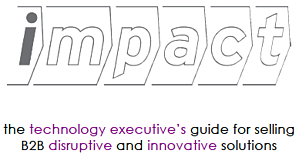 In the IMPACT Universal Buying Process this means the buyer will probably engage after the Assessment of pros and cons of the initiative. Engaging at 57% may be the case for early majority buyers of mainstream products, where an established buying category and a playing field of suppliers exists, but early adopters will engage buyer much earlier in the buying process, typically at Mentor. For commodity products, buyers will engage at transaction. Who needs salespeople to sell commodity products, when the buyer knows what they want and all that is left to decide is quantity and price they are prepared to pay. A familiar problem affecting early new hires is the inability of salespeople to forecast a closing date. In practice, salespeople predict the buyer to be one or two steps ahead of where they actually are in the buying process. 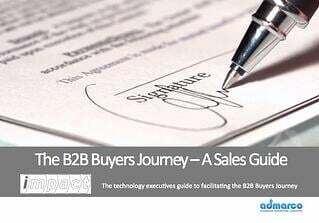 Armed with a solid understanding of how B2B companies buy, salespeople can communicate with buyers appropriately, based on their stage of the buying process. 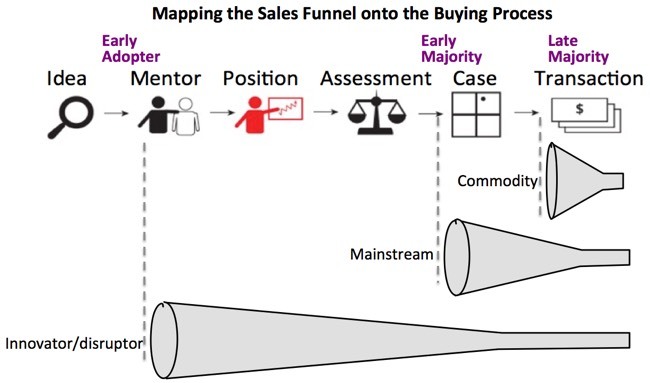 The role of salespeople is morphing into that of facilitators of a buying process; therefore understanding what happens at each step and the questions that buyers must have answered to advance to the next step is a critical sales ramp success factor. A telling statistic from Forrester suggests that buyer’s rate only 1 in 10 meetings with salespeople as worthwhile. Whoa… this means your salespeople are wasting buyer’s time and creating no value in 90% of their sales calls. Let's start here in the sales induction process to jumpstart improving sales performance, as this is the point of maximum leverage. Product “features and benefits” training, sales process, CRM, contracts, demo’s, discounting and expenses are artifacts from last century's curricula for B2B new hire sales training. Sales ramp times are lengthy for this precise reason. It takes twice as long for salespeople to figure out what is important to buyers using trial and error approaches. Call reluctance and long ramp times are caused by this worn-out approach to new hire training. When salespeople learn what buyers really care about and a story that resonates with their objectives or problems, they can make sales calls immediately after new hire and quickly gain confidence and momentum. 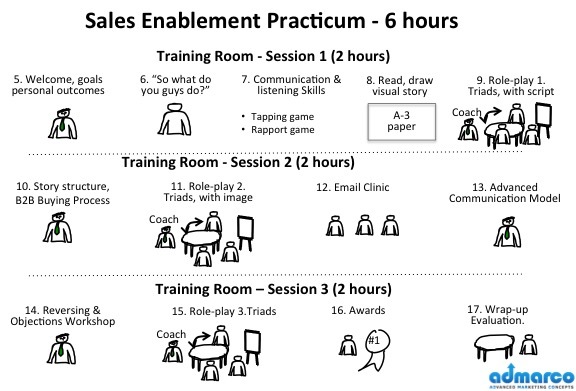 Using whiteboard storytelling training that encapsulates the value creation message, coupled with coaching and certification has potential to reduce ramp time by 50% -- if you do nothing else. A whiteboard story and talk-track that follows the "Challenger storytelling method"
A "who I've helped story"
An A-3 size visual confection and .pdf for salespeople to take into meetings or email to prospects prior to a meeting. CEB’s "The Challenger Sale" methodology for creating commercial insight to disrupt status-quo thinking and create value at every interaction with the buyer has been extremely successful. I use their 6-step storytelling methodology for creating “Why change” stories and recommend it. The hard part in creating “commercial insight” or “why change stories” is in coming up with the insight. 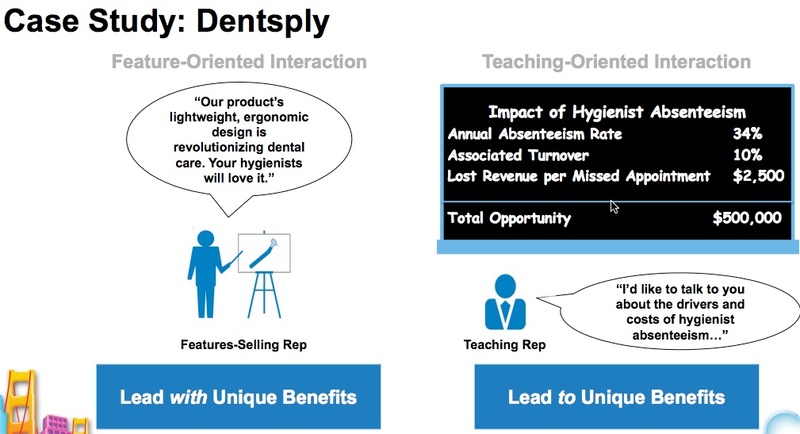 If you have not read the “Dentsply” case study in either ‘The Challenger Sale” or “The Challenger Customer”, then you may wish to download the Dentsply case study from CEB's DreamForce presentation. It explains why killer products don't sell… and how the insight was derived to succinctly capture the “why change story” that caused product sales to skyrocket. True commercial insight cannot be achieved by a couple of marketers sitting in a room brainstorming it out… nor can salespeople come up with it on their own. Commercial Insight is a critical success factor in profitably selling B2B products and services today. True commercial insight is not about the product. It is in the value customer derives from changing from the status-quo and adopting a new method/approach to a business process. The secret is out and it’s not about getting salespeople to present whiteboards to prospects; it’s about getting the story into salespeople’s bodies and minds and making it stick. Many people think that whiteboard storytelling training is designed to get salespeople to give whiteboard presentations in front of customers. It could be, but It’s not how I recommend using them. The purpose of whiteboard storytelling is to create competence and confidence in salespeople and to encourage them to have conversations with buyers instead of presentations. 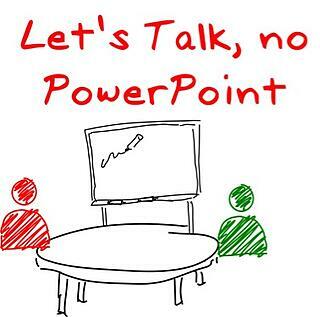 Conversations, not presentations are the goal of whiteboarding. This is achieved through an immersive learning process, coupled with spaced repetition and coaching to create message ownership. You may also need to up-level communication and language skills because salespeople may be selling consultatively for the first time, using the whiteboard storyline as the basis for a conversation. In a typical whiteboarding session we run for clients, salespeople will read, see or do the whiteboard story up to 11 times. They can make sales calls the next day, but will be uncomfortable. When they have done the whiteboard more than 20 times, salespeople will own the story... and we need sales managers to ensure salespeople achieve competency. Salespeople can then use a whiteboard to make a point if needed, the back of a napkin at lunch or simply explain the big-idea with the use of a visual confection in a minute or two. Message ownership is critical to converting initial meetings into second meetings. Another really important concept is managing “air-time” in meetings with buyers. Let’s look at how to manage “air-time” in a typical 30-minute initial meeting with a prospect. The purpose of the initial meeting is to qualify interest and get another meeting, if there is a fit. If we factor in 8 minutes at the outset for inherent delays, rapport development and setting up the listening, we have 22 minutes remaining. We need to reserve 6 minutes to close the meeting, to answer questions, de-brief the prospect and get agreement on next steps. That leaves 16 minutes and we want the prospect talking for 2/3 of that time or for 10 minutes. That leaves salespeople with about 6 minutes talk time. Six minutes is not enough time to do a presentation, nor is it enough time to do a remote or in-person whiteboard. We need to use a Visual Confection, (see the image below), which is an edited version of the competed whiteboard containing the big-idea you want to convey. In a minute or two you can talk the buyer through a complex visual story and that gives you a lot more time to ask qualification questions and drill down on problem/opportunity areas that surface in during the conversation. This simple visual confection below is printed on the back of my business card and I hand it to people I meet with the picture side up. In a glance, people “get” what it is that I do and this invariably starts a conversation that I did not have to initiate. Salespeople learn from each other through observation and modeling. The social learning theory of Albert Bandura emphasizes the importance of observing and modeling the behaviors, attitudes, and emotional reactions of others. Our whiteboard storytelling workshop uses this model. New social learning platforms, like Commercial Tribe are now available to encapsulate the complete whiteboard storytelling workshop process and deliver it remotely, instead of physically flying salespeople to attend in-person learning. Observation: this is watching the "gold-standard" whiteboard presentation, delivered by one of the expert leaders in the organization. Retention: encoding in the brain occurs through repeated observation and practice to promote cognitive and motor models. Reproduction and feedback: including self-observation and accurate feedback from managers and peers. Motivation: including external recognition and certification and ongoing self-reinforcement.